2Department of Anatomy, Kasturba Medical College, Manipal University, Mangalore, India. *Address correspondence and reprints request to: B.V. Murlimanju, Department of Anatomy, Kasturba Medical College, Manipal University, Mangalore, India. Naveen NS, Murlimanju BV, Kumar V, Pulakunta T, Jeeyar H. Thanatophoric Dysplasia: A Rare Entity. Oman Med J 2011 March; 26(3):196-197. Thanatophoric dysplasia is the lethal skeletal dysplasia characterized by marked underdevelopment of the skeleton and short-limb dwarfism. The child will be having a short neck, narrow thoracic cage and protuberant abdomen. Other anatomical features include a relatively enlarged head with frontal bossing, prominent eyes, hypertelorism and the depressed nasal bridge. The diagnosis is usually made with the ultrasonography in the second trimester. In this study we report a case of this rare entity with emphasis on its anatomical features, abnormalities and clinical profile with relevant review of literature. Keywords: Thanatophoric dysplasia; FGFR3; Ultrasound; Fetus. Thanatophoric dysplasia (TD) is a type of neonatal lethal skeletal dysplasias.1 It is characterized by marked underdeveloped skeleton and short-limb dwarfism.1 The name TD is derived from the Greek word which means "death-bearing. "2 TD is caused due to mutation of the fibroblast growth factor receptor 3 gene (FGFR3), which is located on the short arm of chromosome 4. The mutation results in the activation of FGFR3 tyrosine kinase independently of ligands such as fibroblast growth factor 8. This activation of FGFR3 results in decreased apoptosis and increased proliferation.1 It was reported that hypochondroplasia, achondroplasia and thanatophoric dysplasia are the different types of mutation in FGFR3 with hypochondroplasia being the mildest and TD, the most severe form.3 Since the clinical profile of this anomaly was rarely reported, we discuss the anatomical features, abnormalities and clinical profile of TD in the present report. 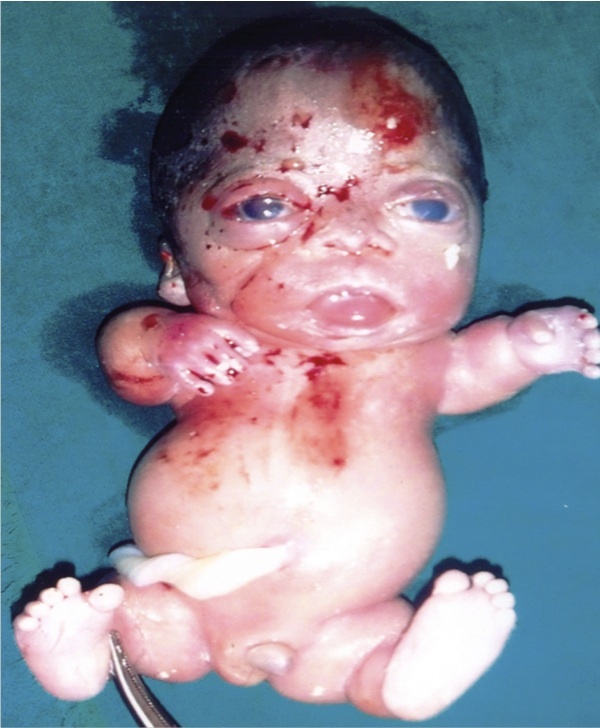 In a Rural Hospital at Kerala State of India, a dead male fetus with many anatomical abnormalities was examined. The mother aged 25 yrs with second gravida and 22 weeks gestation was admitted to the hospital with abdominal pain. Routine ultrasonography revealed a single dead fetus in cephalic presentation with mild hydrocephalus and brachycephaly. The ultrasound also reported anterior narrowing of the skull, short ribs, narrow thorax, increased nuchal translucency, frontal bossing, short fetal limbs and protuberant abdomen. The other features observed include absence of corpus callosum, flattened vertebral bodies, narrow spinal canal. The ultrasound was reported as TD with cloverleaf skull deformity. Then the patient was advised termination of pregnancy. The fetus was examined macroscopically; the anatomical abnormalities were noted and were returned to the mother. On history taking, it was known that the couples had first degree consanguineous marriage and there was no past or family history of congenital abnormalities. On inspection, the fetus (Fig. 1) had large head, frontal bossing, short neck, narrow chest, protruded abdomen and short limbs. The trunk length was normal, but there was anterior narrowing of the skull. After discussing with the pediatrician and gynecologist, the fetus was diagnosed to have TD type 1. In the present report, the written informed consent was taken for the examination. Figure 1: The Thanatophoric dysplasia in the fetus of 22 weeks of gestational age. The short neck, small thoracic cage, protuberant abdomen and short limbs were the typical features. In the present case, we observed that the fetus (Fig. 1) was having frontal bossing, large head, short neck, narrow chest, protuberant abdomen and short limbs. The anterior narrowing of the skull was present, but the trunk length was normal. The fetus was diagnosed to have TD type I. The detail regarding this anomaly was rarely reported in the literature. So we believe that this study has provided optimum knowledge on this subject and is important for the budding medical students, doctors especially the obstetricians and pediatricians. The report is also useful to the clinical anatomists, embryologists and morphologists. 1. Miller E, Blaser S, Shannon P, Widjaja E. Brain and bone abnormalities of thanatophoric dwarfism. AJR Am J Roentgenol 2009 Jan;192(1):48-51. 2. Orioli IM, Castilla EE, Barbosa-Neto JG. The birth prevalence rates for the skeletal dysplasias. J Med Genet 1986 Aug;23(4):328-332. 3. Cohen MM Jr. Achondroplasia, hypochondroplasia and thanatophoric dysplasia: clinically related skeletal dysplasias that are also related at the molecular level. Int J Oral Maxillofac Surg 1998 Dec;27(6):451-455. 4. Fink IJ, Filly RA, Callen PW, Fiske CC. Sonographic diagnosis of thanatophoric dwarfism in utero. J Ultrasound Med 1982 Oct;1(8):337-339. 5. Lam AC, Lam YY, Tong TM, et al. Thanatophoric dysplasia type 1 (TD1) without "telephone receivers". HK J Paediatr 2006;11:320-323. 6. Langer LO Jr, Yang SS, Hall JG, Sommer A, Kottamasu SR, Golabi M, et al. Thanatophoric dysplasia and cloverleaf skull. Am J Med Genet Suppl 1987;3:167-179. 7. Machado LE, Bonilla-Musoles F, Osborne NG. Thanatophoric dysplasia. Ultrasound Obstet Gynecol 2001 Jul;18(1):85-86. 8. Wong HS, Kidd A, Zuccollo J, Tuohy J, Strand L, Tait J, et al. A case of thanatophoric dysplasia: the early prenatal 2D and 3D sonographic findings and molecular confirmation of diagnosis. Fetal Diagn Ther 2008;24(1):71-73.